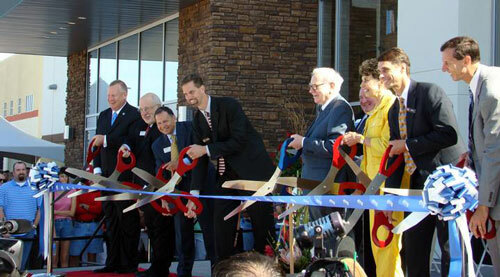 Ribbon Cutting Ceremony History: Why Are The Scissors So Big? The evolution of the ribbon-cutting ceremony, as seen through the sharp blades of a huge pair of ceremonial scissors. Did a bridge just open nearby? Today's GIF comes from a ribbon cutting at a Nintendo store. I had to use it because if it's not The Year of Luigi, it should be. P.S. : Shout-out to Christopher Mims for the idea. — A passage from the September 1886 edition of The American Mail and Export Journal, discussing the history of scissors. The origin of the scissor is believed to be during the Bronze Age, with examples dating back more than 3,000 years. (The 1886 piece suggests that scissors were found in Egyptian tombs, but then again, it’s 1886.) These scissors tended to be of a single piece, and were connected by a flexible piece of bronze—effectively, a spring. The more modern form of scissors, made of two pieces and connected by a screw or similar device, were reportedly first used in ancient Rome, China, Japan, and Korea. Looking up information about the origins of the ribbon-cutting ceremony is less like a ribbon and more like a thread, really. Most commonly, it’s implied that the first ribbon-cutting ceremony involved a Louisiana rail line in the late 19th century, but information is incredibly scarce on this—just one webpage on the entire internet appears to come close to anything looking like a primary source. Nothing against the fine folks of Union Parish, Louisiana, but I didn’t feel like that was enough to go by. So, I kept digging, like that time I tried to source the origins of the fingernail clipper. 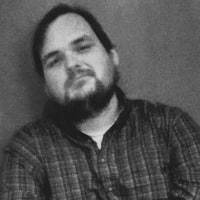 Now, as close readers of Tedium might have figured out by this point, I do a lot of digging in resources that are either public or commercially available, such as Newspapers.com, the archives of magazines like Time and newspapers like The New York Times, and the Internet Archive. And I think that I’ve never had a harder time finding the origin of an idea as I have the ribbon cutting ceremony. It’s something that it feels like we’ve done forever, but it’s only a relatively recent phenomenon. But here’s what I think happened. If there’s more evidence out there, I’d love to hear it. 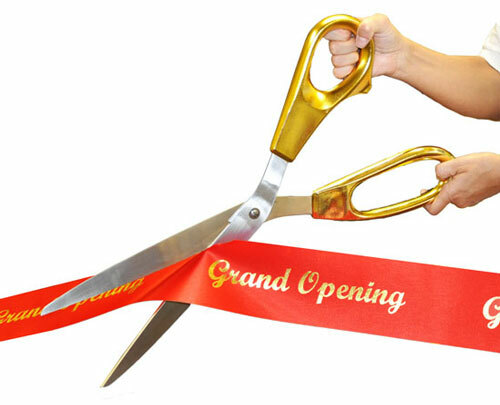 The earliest examples of ribbon-cutting ceremonies I can find are in relation to boat or dock christenings, around the late 19th century in the United Kingdom. These christening ceremonies, which generally involved the smashing of wine bottles against the ship and at times involved ribbon, but not necessarily the cutting of said ribbon, as highlighted in a passage from Nathaniel Hawthorne’s English Notebooks, in which the bottle was simply thrown. Christening ceremonies go back far longer than ribbon-cutting ceremonies, but the wine bottle smashing only became a thing about a century before. A less successful ribbon-cutting attempt from that year involved the launch of a steamship in Barrow-In-Furness. According to The Leeds Mercury, the ribbon-cutting was just about to occur around 11 a.m. that fateful day, with Lady Constance Stanley about to do the honors of trimming the blue ribbon with a pair of scissors, when a loud explosion was heard. The incident, a boiler room explosion, killed three men, but shockingly, that was not enough to stop the ship christening from taking place. Too much was riding on the ship’s departure—specifically, the tide—to hold it up much longer. As should be made clear from these maritime anecdotes, ribbon cuttings were, from the start, dedicated to large events that required the work of lots of people, and often prominent people to do the honors of cutting those ribbons. New buildings are a great example of things that often invite a ribbon-cutting ceremony; bridges, even better. One thing appears to be clear, at least in terms of how we consider it today: The phenomenon of ribbon cuttings was nonexistent before the late 19th century, and barely on the radar during the early 20th century. But certainly, there was a point where such ceremonies started happening more often, and that time, just like with the frozen pizza, was after World War II. The rise of the modern interstate highway system in the United States was certainly a factor here, as freeways and other more modern roadways meant the creation of a lot of bridges, a lot of tunnels, and everything in between. These things changed a lot of lives, and the ceremony, in its own way, reflected the desire for a clear path forward. 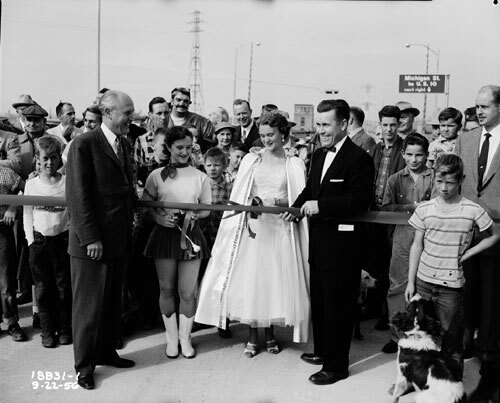 It’s arguable, then, that the heyday of the ribbon-cutting ceremony was in the 1950s and 1960s, with reverberations into the modern day. But what about the giant scissors? — Tommy D’Alesandro, the 1950s-era mayor of Baltimore, offering a snappy comment during a 1958 ribbon cutting ceremony in honor of the first helicopter service between Baltimore and Washington, DC. D’Alesandro, in a break of protocol, tried to cut the ribbon himself, despite the fact that Governor Theodore McKeldin was there do do just that. Miffed at the slight, D’Alesandro tried to run off, only to win sympathy from the audience, and was allowed to do the initial cut of the ribbon. McKeldin cut the ribbon into small pieces to hand out to friends and lamented, “I’m not disappointed. We Republicans learn not to be disappointed. I’m grateful for small favors.” D’Alesandro, the father of current House Minority Leader Nancy Pelosi, was running for Senate at the time. Golden Openings’ 25-inch scissor model. Quite often in these newsletters, I highlight the stories of companies whose ideas somehow manage to punch above their weight class. Maybe they’re not obvious things, like social networks or hoverboards, but their ingenuity and clever approaches help them to cut a place for themselves in the marketplace. There’s the tale of Steve Grubbs, the Iowa political operative who came up with a business that modernized the political yard sign; the guy who turned his failed company into the largest maker of suction cups in the entire country; and Bob McDermand, who came up with a successful business around the mouse pad. Another one to add to this list of innovators is Kimberly Baeth, the president and founder of a firm called Golden Openings, which specializes in services and products for grand openings—and whose signature product is a gigantic pair of ceremonial scissors. While there are examples of ceremonial scissors that existed before Baeth’s company launched in 1997, her business added both sheer scale and innovation to the concept, finding that the scissors were basically the perfect PR tool for many a new business. And her giant scissors are actually intended to work as a functional pair, just in case you have something else to cut. How’d Baeth come up with this wild idea? Well, back in the ’90s around the time of Romy and Michele’s reunion, she served as the membership manager of the North Hennepin, Minnesota, Chamber of Commerce. And in this role, she often relied on ribbon-cutting ceremonies to drum up interest in new businesses that were getting started in the community. “Sometimes, depending on the business, the governor would come, the mayor would come, it could be on TV and in the newspaper and people got excited,” Baeth explained. Looking for a way to further drive interest in these ceremonies and to create a bigger splash, she came upon the idea of putting together large novelty scissors as an attention grab for events. She created a pair of fake scissors to test the idea, then after those proved to be a bit of a hit, she asked her father to create a wooden pair for her as a way to further test the market. Those became even more successful—and showed that there was an opportunity not only for giant scissors, but for someone to organize grand opening events for new businesses. Soon afterwards, she quit her job at the chamber and started working with a manufacturer to create massive scissors stainless-steel scissors—the first of their kind. Soon, they would come in all shapes and sizes. “From template to production of our first 100 scissors took about 18 months to get them to cut, the right weight, look and feel,” she said. Her husband gave her a year to turn the idea into a profitable business—a deadline she was easily able to hit. “Not even the unexpected three-week early arrival of my first daughter, Stephanie, put a halt in my busy schedule,” she said. These days, the company—which moved to Iowa in the mid-2000s—does quite well for itself. While the company isn't alone in its niche anymore, it's probably the one with the biggest presence. The firm, over the years, has diversified beyond simply ribbons and scissors into events of all shapes and sizes. For one thing, they sell shovels, a necessity for groundbreaking ceremonies. Certainly, though, the scissors get high billing; the website features numerous pictures of major celebrities like Warren Buffett, Oprah Winfrey, Michelle Obama, and Donald Trump using the massive-yet-sharp devices, which sell for hundreds of dollars each. “We have also made completely custom scissors for many customers including but not limited to Lady Gaga and Google,” Baeth said. For its part, Golden Openings has been seeing a lot of ceremonies of its own lately—awards ceremonies. Last year, the firm was named the Dream Big Small Business of the Year by the U.S. Chamber of Commerce, and Baeth was recently named one of Enterprising Women’s Enterprising Women of the Year. Perhaps it’s fitting that a company that’s often the first act to many success stories would become one of its own. The length of the largest pair of scissors that Golden Openings sells. (On the website, Jamie Foxx is shown holding a pair.) While it’s not the largest pair of functional scissors in the world—that honor goes to author Neerja Roy Chowdhury, who produced a 7'7' pair to promote a comic book series in 2009 according to Guinness World Records—it’s perhaps the longest pair you can find designed for ceremonial purposes. So, back to the original question: Why scissors and why ribbons? There’s something about this phenomenon that has a lot of power to it. And not just because famous people often do the cutting. Quite often, these ceremonies represent turning points in people’s lives, whether for a single individual who did something really impressive, or a community that will find life just a little bit easier thanks to a new service available to them. Like the cutting of a wedding cake or the throwing of a cap and mortar into the air, taking a ribbon and splitting it in two speaks to the idea of new beginnings. When I asked about the significance of these tools and these ceremonies, Baeth pointed me in two interesting directions. 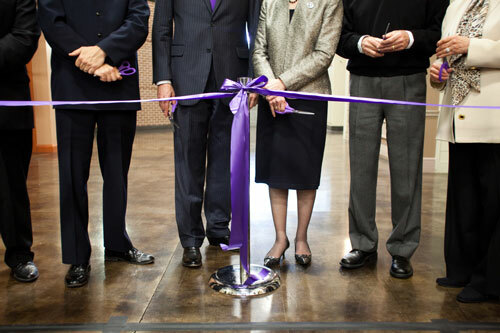 First, she pointed out that ribbon-cutting ceremonies, including some her company has taken part in, have become common in Buddhism, reflecting the heavily symbolic nature that ribbons often have in that religion—particularly, the colors. Another example she highlighted was the story of Eileen Foley, the New Hampshire politician who cut the ribbon on the state’s Memorial Bridge when she was just five years old. In 2013, at the age of 95, Foley had the chance to do it again when a new version of the bridge was put into place. There’s something of value to these ceremonies, and the way the blades of the scissors cut through the fabric of the ribbons, no matter how comical or offbeat these events can seem at times. Whether at the end of a long road or the beginning of a fresh start, the cutting of a ribbon may be the best tool society has to reflect on its many feats.